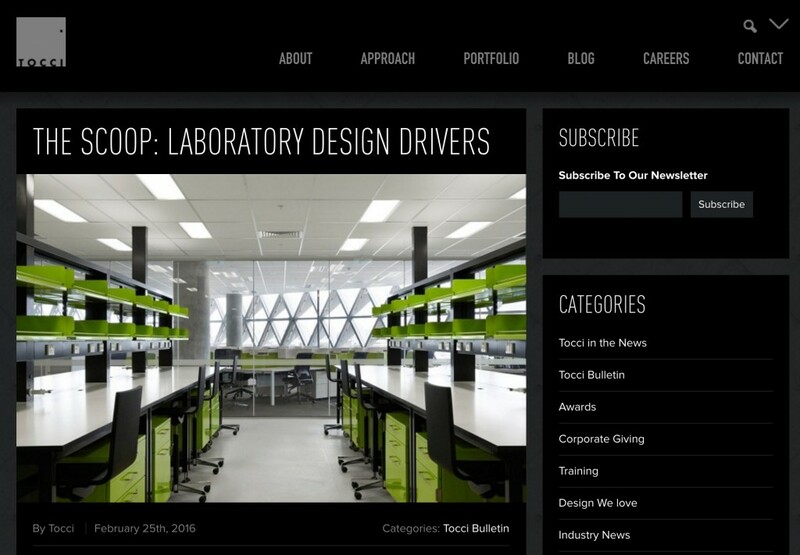 This Tocci Building Companies blog posting describes trends in laboratory design research — and is an example of the blog’s comprehensiveness. 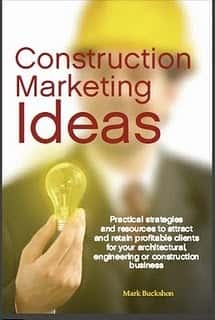 Massachusetts-based Tocci Building Companies won the 2015 Best Construction Blog competition, and has certainly amassed at the time of writing this post (March 22) the highest number of popular votes for the 2016 competition. Will this well-designed and content rich blog win again in 2016? That is hard to say — the judges have several other worthy contenders to review and they may bias against giving the same blog a “win” for both years — but certainly this blog is a worthy finalist and possibly two-time winner of the competition. 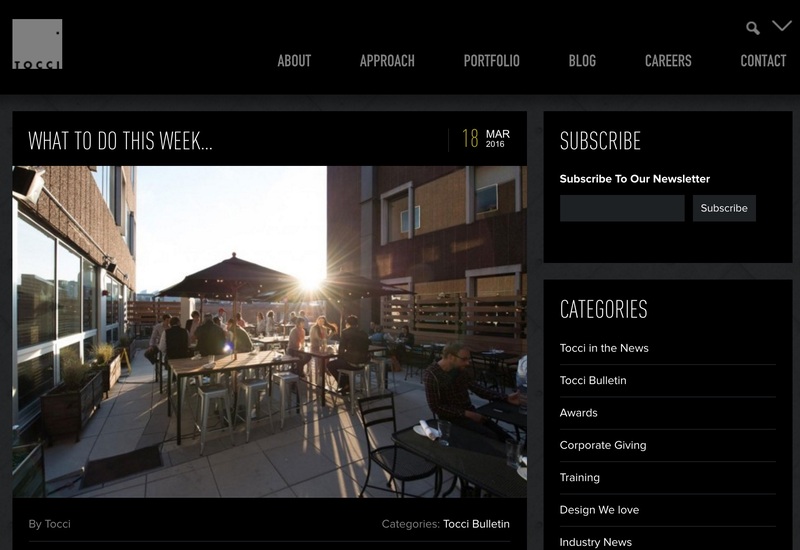 Tocci’s blog combines internal news, reports on exciting and interesting projects, and insights about design and construction trends. 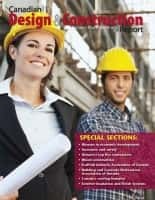 Consider this report about laboratory design — a relevant topic considering the contractor’s presence in the US northeast biomedical research environment. Laboratory spaces have moved away from the fixed workbenches with storage cabinets and equipment with little to no capacity to hold a meeting or accommodate changes to the evolving discipline. New spaces are now geared toward collaboration and chance encounters that trigger new ideas in order to facilitate innovation. This is especially important for pharmaceutical companies who need to get products to the market faster and faster. This trend has impacted lab design to have more open and flexible space to attract the brightest talent. Mobility: Many experiments and bench processes are now automated or mechanized and data generated from these test needs to go beyond the bench and placed online, so experiments can flow smoothly from one process to the next no matter where the next piece of equipment may be. New work Style Rules: More meeting spaces inside labs in addition to traditional meeting rooms outside the lab allow for increased. This goes along with having longer lab bench areas, to chat with more colleagues and share ideas with those of various backgrounds and disciplines. It’s also important to be able to move freely around the building to find the space that is most conducive to your learning and thinking processes. Economy and Sustainability: Scientists often prefer working in an environment that is efficient and leaves little impact on the natural world around them. It’s important to have new fume hoods and ducts for linking air contaminates to the rate of air exchange. Integration of different fields: Providing spaces for multiple disciplines relating to STEM (Science, Technology, Engineering, Mathematics) Programs that speed up research and innovation, such as the growth in translation medicine where bench research is directly connected with healthcare. The content here is supplemented by graphics of successful laboratories both within Tocci’s own portfolio, and others around the world. This is content that would be useful to lab space designers or builders anywhere, and in my opinion reflects the sort of information that makes great blog. You can vote for this blog (and others you like) until March 31.